With Golbon Destinations your time is spent discovering and delighting in an extraordinary place. Whether it’s one of Europe’s grand cities, or an exotic tropical hideaway, each carefully-selected location offers its own blend of sights, sensations and flavors. As you begin your experience, you quickly find that you are already in the company of not just industry peers, but friends. “The mystery of Crete runs deep. Whoever sets foot on this island senses a mysterious force coursing warmly and beneficently through their veins, sensing their soul beginning to grow.” – Nikos Kazantzakis, Crete’s most celebrated author (of Zorba the Greek), in Report to Greco. Crete is located in the southern part of the Aegean Sea separating the Aegean from the Libyan Sea. Official Language: Greek; however English is widely spoken in tourist areas. Weather: Crete is the best year-round destination of any Greek Island. In May we should have warm, pleasant weather, yet still may encounter some overcast days. It should be perfect for sightseeing, and enjoying the history, wineries and culture! The Blue Palace is tucked away in the Gulf of Elounda, about an hour from Heraklion, the capital of Crete, and location of the international airport. Endless views, crystal clear waters and a host of cultural and gastronomical experiences await guests at Blue Palace, a Luxury Collection Resort and Spa. Discover unique dining experiences within five restaurants and select from a variety of exquisite Mediterranean dishes, traditional Greek specialties and cuisine with an international flair. Nourish body and soul with a signature spa treatment, or simply indulge in the sea or pools, while rejoicing in a landscape of breathtaking beauty. Check it out! 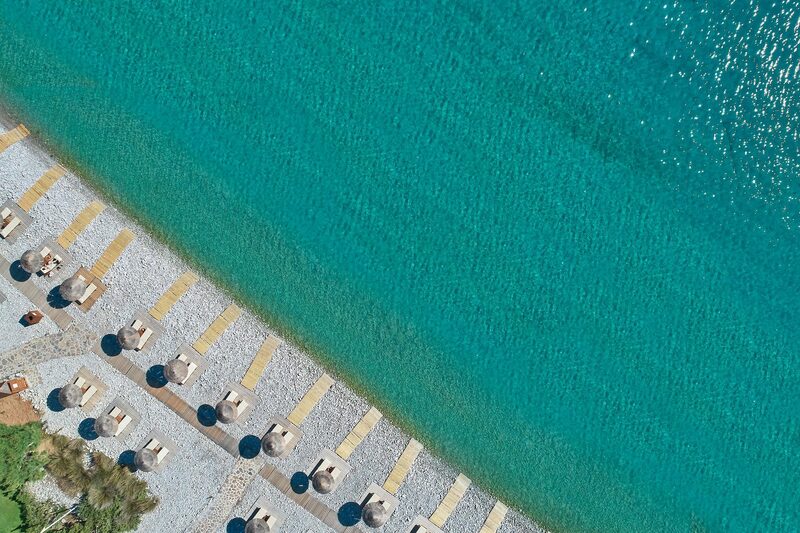 The Blue Palace was rated the #3 resort in Greece in Travel & Leisure’s 2018 survey of the world’s best in travel; the island of Crete came in #5 of all European islands. Your travel arrangements are part of your Golbon Destinations experience, and we strive to make it easy for you. Once you are registered for the trip, our travel agent will assist you with booking your airline tickets. Golbon Special Events will secure your room reservation at our event hotel, and arrange for your ground transfers between the airport and hotel. Leading up to the trip you’ll receive a detailed itinerary with activity options to select from, and descriptions of our evening events. We aim to offer experiences that will appeal to the variety of personalities and interests inherent in our guest list; you can expect to have great choices for creating an itinerary that speaks to you personally. We’ll also provide you with helpful travel tips so you know what to pack and what to expect. We attend to the logistics of your travel, allowing you to simply relax and enjoy. Are you ready to join us? Registration is opening online later this summer. Questions? Please e-mail us at events@golbon.com. Transportation between Heraklion International Airport and the Blue Palace, Crete on May 8 and 14. Six nights’ accommodations at Blue Palace, Crete over program dates. Special gifts and much more! General registration form must be received by Golbon and airline ticketing must be completed no later than the published deadline to avoid a minimum surcharge of $125 per attendee. Accommodations are booked for a maximum of double occupancy each room. Third guest in room incurs charge of $100 per night. All tours are pre-arranged and pre-paid by Golbon; any changes made onsite to pre-selected recreation will result in a charge of $150 per change. Rooms, meals and activity costs are pre-paid for by Golbon in advance. In event of cancellation, any cancellation fees or other costs incurred will be deducted from participant’s Golbon Destinations points. Trip packages must be accepted as presented; no offsets or other considerations for adjustments to the package. Golbon will not be liable for any and all claims arising from accidental harm, injury or death to a person or persons, or for damaged or lost possessions, while attending Golbon Destinations Incentive Trips. The liability form that will be provided must be signed and returned for each attendee prior to airline ticketing.